You would think that a French sporting event of the magnitude of Tour de France would have a French wine company as one of its sponsors. No, it’s not a wine from France which is associated with this prestigious and legendary event; where cyclists have to traverse 3500 km of flat and hilly terrain and after a grueling three weeks, finish on the Champs-Elysées in Paris. It is the Chilean wine Cono Sur which is the official wine of Le Tour de France 2015. Not all that surprising since the brand’s connection to cycling is through its Bicicleta (Bicycle) range of wines. Why the bicycle logo? Because bicycles play a very important role in the upkeep of their vineyards in Chile. Keeping up with its commitment of using sustainable agricultural practices, Cono Sur, meaning “Southern Cone” has developed viticulture which does least harm to the environment and there is emphasis on the use of non-chemical fertilizers, pesticides etc. Workers in the vineyards use bicycles to get around and how much of carbon footprints can that leave. Zero would be my guess. In fact Cono Sur is the first winery in the world to obtain Carbon Neutral status. Associating with a famous cycling event like Tour de France is thus a natural progression for the company. Cono Sur Vineyards & Winery, founded in 1993 in the Colchagua Valley of Central Chile, as a subsidiary of Chile’s biggest wine company Concha y Toro, is the world’s largest producer of Pinot Noir in South America and among the top five producers of Pinot Noir in the world. Someone has even called it the world’s best value Pinot if one keeps in mind the price point at which it is offered. Though vinified in the traditions of Burgundy (Project Pinot Noir 1999) it does fall a little short compared to the elegance and restraint of the Old World classic, the Burgundian Pinot Noir. Yet it is way better than some of the cheaper Pinots from the new world which can turn out to be watery, thin and green or some of those from the US which are very often over-oaked. In fact the Decanter magazine in Sept 2013 voted the Cono Sur Bicicleta Pinor Noir 2011 as the Best Value South American Red wine under $15. This is a brand which outsold Pinot Noirs from New Zealand in volume and was the top selling Pinot Noir in 2014 in the UK. Good news for Indian wine lovers is that this popular wine is available in India, brought by Sula Selections, the import arm of Sula Vineyards. While Sula Vineyards are the biggest producers of wine in India commanding a hefty 65% of the market share, they also have an import arm, Sula Selections, which imports and distrubutes wines, spirits and beers in India. Their impressive wine portfolio includes Piper-Heidsieck Champagne from France, Ruffino from Italy, Hardys Stamp of Australia, Mudhouse of New Zealand, Trapiche from Argentina, Kumala from South Africa along with the Chilean Cono Sur. Coming back to Cono Sur Bicicleta range, I got a chance to try out both the Chardonnay and the Pinot Noir at an excellent Wine dinner held at Pan Asian, Sheraton New Delhi. 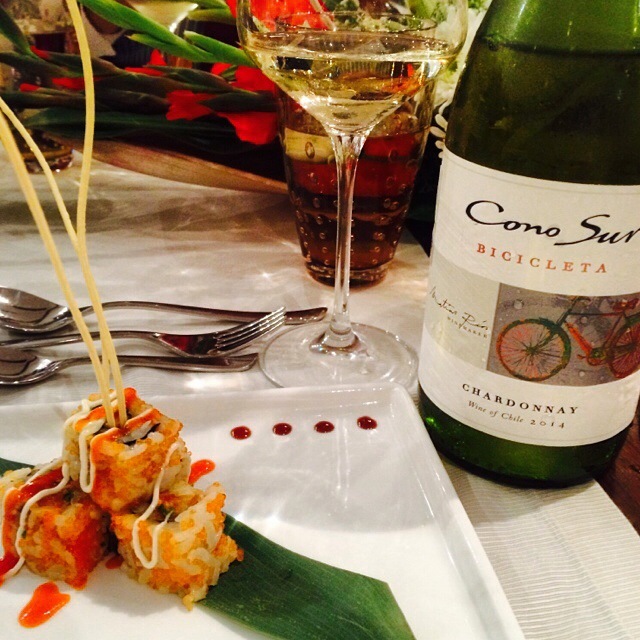 The Cono Sur Bicicleta Chardonnay 2014 was very appealing in appearance, yellow with golden hints. The nose was a mélange of citrus and tropical fruits, tangerine, melon, peach, honeysuckle and pineapple. On the palate it had nice mineral notes, good acidity and balance. Not an outstanding Chardonnay, but a good one nevertheless and at Rs 1000 for a 750ml bottle, good value for money. It was the Cono Sur Bicicleta Pinot Noir 2014 (Rs 1120) which stole the show at the dinner. A fruit driven Pinot with cranberry, cherry, strawberry and raspberry. Medium body with soft juicy tannins and a silky texture, it finished on a spicy note. An elegant and refreshing Pinot Noir which combined the best of the old and new world. In Delhi both these wines are available at “The Taste” at Defence Colony Market and A to Z liquor shop in the Multi-Level parking premises near New Delhi Railway Station. Cono Sur has a very interesting motto “no family trees, no dusty bottles, just quality wines” Thanks to Sula Selections we have access to these eminently palatable wines which are a remarkable value for money.